A traditional midwife in Guatemala examines a pregnant woman. Source: PIES de Occidente. Despite the enormous progress that has been made in reducing rates of maternal and infant mortality, over 300,000 women still die every year of complications from pregnancy and childbirth. Six million children under the age of five die each year as well. Millennium Development Goals 4 and 5 fell shortest of their targets. Traditional midwives play a central role in preventing mortality, attending births and caring for mothers and their newborns. But their possibilities vary greatly. Millions of women in developing countries either have no access to prenatal care during pregnancy or do not know how important it is. Births are not attended by medical professionals, and some women bring their children into the world without any support at all. Women and newborns often receive no care during the postpartum period. Around 830 women die each day of complications from pregnancy and childbirth, as do 18,000 children under five. The causes are primarily poverty, a lack of information, inaccessible medical facilities, inadequate health services and cultural factors that can include discrimination against certain groups. The lack of qualified medical personnel is one of the main reasons for high rates of maternal and infant mortality. The World Health Organization (WHO) estimates that in 2013, the world was short of 9 million midwives and nurses, who also frequently attend births. Only 78% of births are attended by qualified medical personnel. That number is even much lower in poor countries. Maternal mortality is very unequally distributed, not only among continents and countries, but also within individual countries. It varies based on social status, education level, ethnic background and place of residence. Women in rural areas are at a significant disadvantage: Of the 40 million births that were not attended by medical professionals in 2012, 32 million took place in the countryside. Preventive measures are also inadequate. Only about half of all women in developing countries receive the minimum of four prenatal examinations recommended by the WHO. 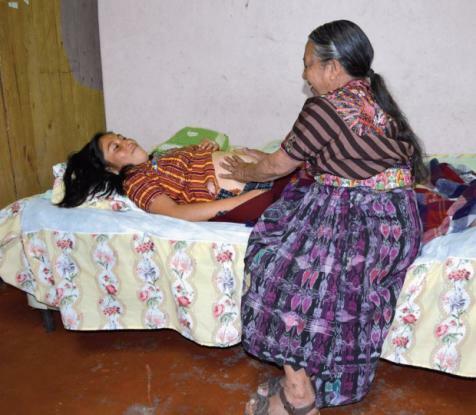 In Guatemala, midwife is not an independent profession. Instead, obstetrics is a medical speciality. Births are usually attended by obstetricians or general practitioners in hospitals, but more often by nurses in rural areas and in smaller health centers. There are not nearly enough of them, however. After Haiti and Guyana, Guatemala has the lowest health worker density in Central America, with 12.5 clinicians per 10,000 residents. Maternal and infant mortality rates are far above the Central American average. In 2013, the maternal mortality ratio was 113 deaths per 100,000 live births, meaning that rates could not even be cut in half compared to 1990’s levels. The goal was to reduce mortality by 75%. The number of deaths is over twice as high among indigenous peoples. “The prevalence of maternal mortality reflects the position of women in society, their limited access to health and nutritional services and their precarious economic situation,” says Aura Pisquiy, a physician and the director of the Guatemalan non-governmental organization (NGO) PIES de Occidente, which has advocated for better sexual and reproductive health and the rights of indigenous women in the western highlands since 1996. The overwhelmingly indigenous population in this region often cannot reach health facilities. Even if they do, health workers do not usually speak their language, and patients feel discriminated against. As a result, traditional birth attendants, known as comadronas, assume responsibility for women’s care during pregnancy and childbirth. There are 22,500 comadronas officially registered, but their number may be much higher. According to a national survey of maternal and infant health, they attend 31% of births nationwide and as many as 60% in regions with large indigenous populations. Comadronas are women who feel “chosen” for this role and have learned midwifery primarily through practical experience and guidance from their mothers. Their responsibilities include prenatal care, birth attendance, postpartum care and care for newborns and babies. If complications arise, they are supposed to bring women to state-run health facilities. Comadronas are respected authorities in their communities and important confidants for pregnant women. They usually do not receive formal payment for their services, but instead are given what families can afford: a small sack of rice, a couple of eggs, maybe a hen or in some cases money. At PIES, comadronas learn for instance how to clearly recognize dangerous symptoms in pregnancy and to bring their patients to health facilities. Improving cooperation between comadronas and public health facilities and their staff is one of the NGO’s main focuses. “The public health system should value Mayan traditions and recognize that they are part of Guatemala’s cultural and social reality. The two systems should complement one another and cooperate in clearly defined ways,” Pisquiy explains. But practitioners’ lack of mutual respect and lack of trust in each other’s abilities still often stand in the way of coordinating community-based care with the state-run health system. The comadronas are reluctant to refer patients to public health centers or accompany them there because the staff have treated them badly and discriminated against them many times in the past. Medical professionals frequently have very negative stereotypes about the abilities of the comadronas. They used to be blamed for the country’s high rates of maternal mortality. PIES includes health workers in its projects in order to overcome prejudices and improve mutual understanding through personal contact. The coma­dronas also learn to recognize the limits of their capabilities when it comes to birth attendance. Pisquiy criticizes: “Despite the indisputable support that the comadronas provide and the great responsibility they assume for maternal health, they are still not adequately valued, promoted or supported by the Ministry of Health.” But she thinks attitudes are slowly changing. According to her, there have been slight changes in policy over the last few years. This post originally appeared on the Development and Cooperation website.